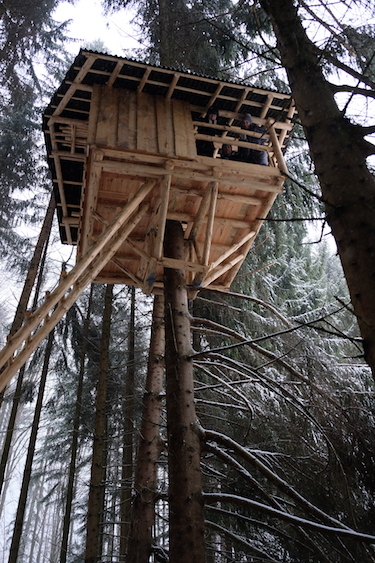 „Hayo also just built a treehouse for himself“ my dear friend Anna tells me at my late birthday party in November. 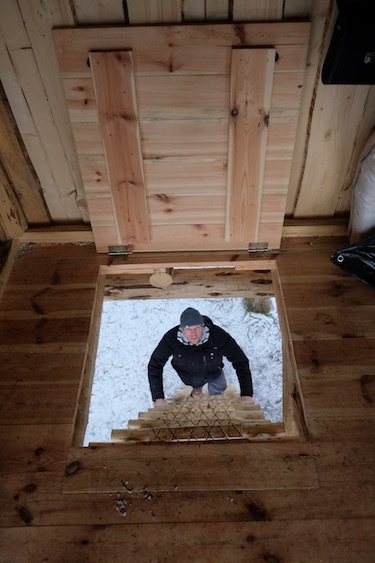 „You definitely have to meet him, I’m sure you’d like each other!“ Engineer Hayo Stam has moved from Netherlands to Austria six years ago to build a guest- and seminar-house. The concept he runs together with his partner Lisa is called „In the Woods“. The protective place in the nature and the lovingly arranged house offer space for exchange, support and inspiration. The guardians of the place Hayo and Lisa invite their guests to „just be“, coachings, seminars & transmigrations of souls. They aim to make all their guests feel at home. 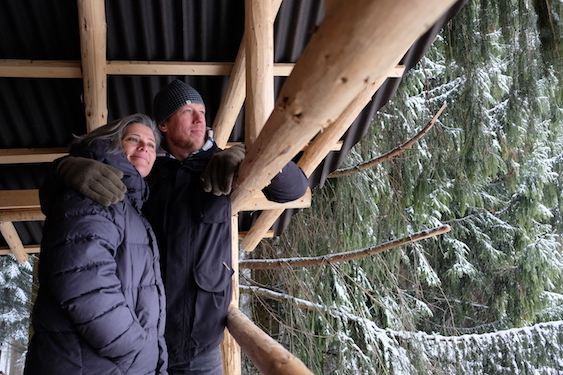 Last weekend we visited Hayo and Lisa there, because since last year there’s a treehouse peeking out from the spruce forest in Finsterau. Hayo Stam built it all by himself and fulfilled his longtime vision with it. Hayo, where did the idea of your own treehouse emerge from? That idea developed very early already. 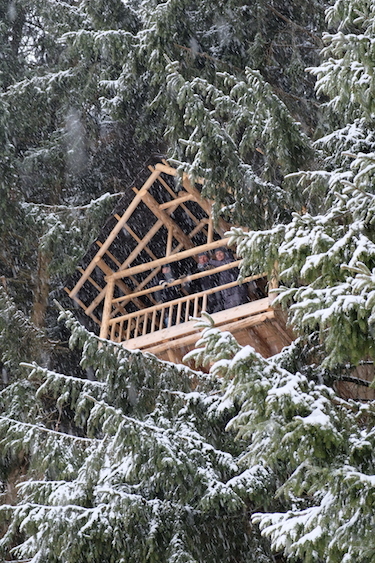 When I saw our forest plot, I already envisioned a platform high up in the trees. Or a nest with a roof, but open. I had that idea in my head for some years already. 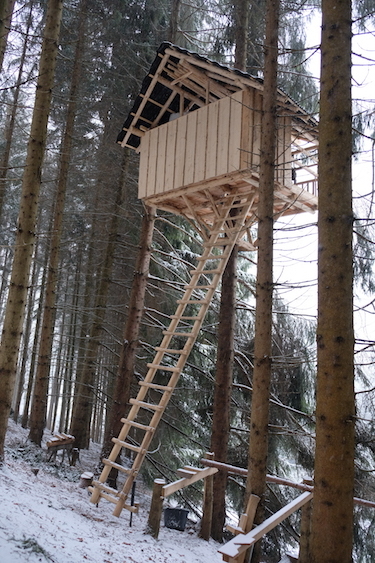 How did you find the appropriate place for your treehouse? That simply was the sunniest spot on the property. I climbed up a tree there, saw the Traunstein (a mountain close by) and knew it had to be there. 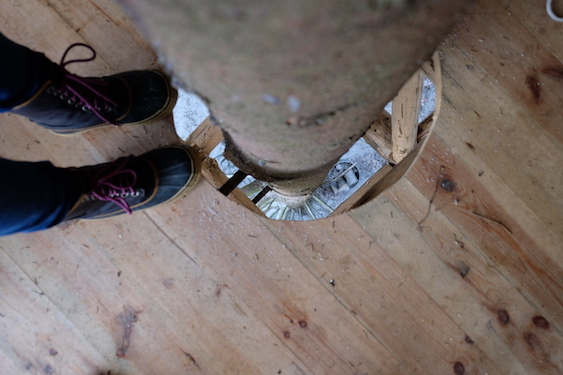 I then selected the straightest and biggest tree strong enough to hold the treehouse. With whom did you realize your project? Only together with my nephew Twan the idea really gained some momentum. When he came to visit us with his mother and his brother some times we always worked in the woods together, felling trees, chopping wood and making bonfires. Twan seemed to enjoy our working together. When I heard of him having a hard time at school, I thought it might be a nice idea to start that project together. He was hooked immediately. I then implemented the project half with Twan and half with my father, a retired engineer, and on my own from time to time. Working with Dad, how did that work out? My father always liked to rebuild homes in his spare time and from the cradle I always was involved. I learned a lot from him. So we worked a lot together already, we’re pretty good at it. And he also has a lot of good ideas. With me nephew Twan the collaboration was something new. 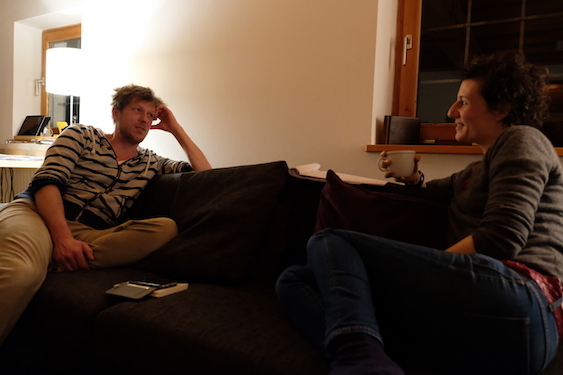 I tried not to stipulate too much, but to let him think too. That was quite a challenge, because I had such a clear vision already. It was very nice that he also had very good ideas, like for example he developed a new technique of how to strip the bark from a tree. What were your first steps then? At first I asked Twan about his treehouse ideas. Since he didn’t have any experience or clue, I made a draft on the computer the way I could imagine it to be like. I actually imagined it to become a bed. And I wanted to keep it simple and symmetric. And slowly the shape evolved. 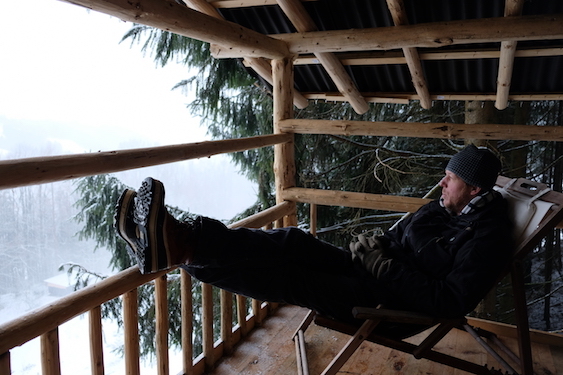 And I made sure the treehouse would stay dry inside. Also the ladder is detachable at the bottom so it can hang free under the platform and be protected from the weather there. I made all the preparations for the single construction parts at the bottom of the tree. How do you use your treehouse? Last summer we spent some nights in it. I can imagine very good to withdraw for a nap or with a good book there. A fireplace in the treehouse would also be an idea. Nine days with Twan, three days with my father and a couple of hours on my own every now and then. Maybe twenty days altogether? And how can I imagine its dimensions? 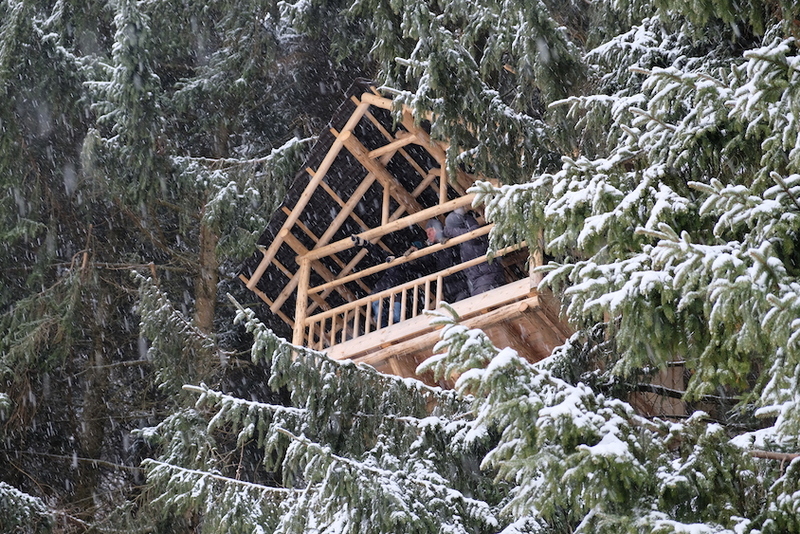 The house is up seven meters (21 ft) .above the ground and it’s 3×3 (9×9 ft.) meters in size. What experiences did you make during construction? For me it was a big leap and overcoming to cut down a 30 year old tree. I wanted to make more space for the treehouse, but I almost couldn’t do it. 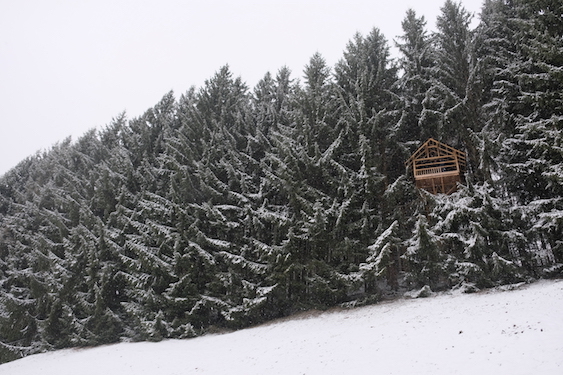 What’s the special nature of your treehouse? 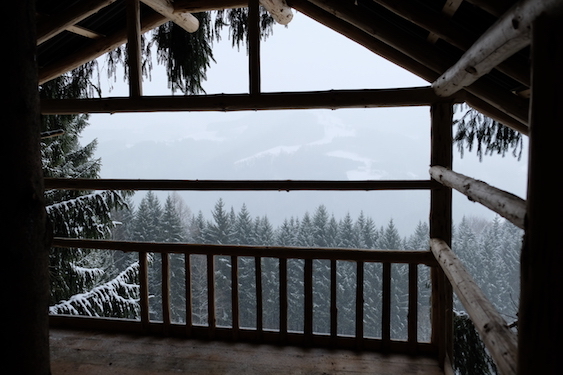 That we built it ourselves, the wonderful view of the Traunstein and that it’s open. I like it when the wind blows over my face and I feel the surrounding nature up there very close. Which animals can you watch from up there? During construction a buzzard flew past my very close and in the night I’ve heard deer but didn’t see them. Did you have a treehouse as a kid? No, not like now. A few boards in the tree maybe sometime, but you wouldn’t call that a real treehouse. Can you imagine to live permanently live in a treehouse? Yes, I think I could. Again and again I notice how little we really need to subsist. If this place (the bed&breakfast in which the couple also lives) wasn’t used by our guests, it would be way too big for me. What don’t you wanna miss at your treehouse? The tree! (laughs). No, a bed to sleep in, seating options and a natural source of light? What band plays for you at the bottom of the tree? I really like to listen to the sound of the screech owl in spring. Other than that I can imagine classical, harmonic and calm music very good. What drink would you recommend your treehouse-guests? Larch- or Arolla Pine schnapps is it for me! And what would go along as treehouse-provision? What would be a good treehouse read for a cozy reading hour? The first thing which comes to my mind is freedom. And simplicity. An aim in life for me also is to be more present. As a child I wasn’t very attentive, my attention was always with the others. It was very easy for me to feel for somebody else, but I didn’t feel myself so much. Life went past me like a movie. That changed already now. Now I experience life a lot more immediate, I feel more alive.